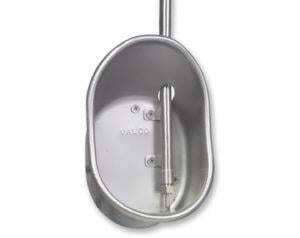 VAL-CO Hog Drinkers are suitable for any age pig, from piglets through finishers. Hog drinker cups are made with 304 grade stainless steel and have seamless cup edges so they are easy to clean and don’t cause injury. The welded oversize pipe thread eliminates leaks, making this the most efficient swine watering system. Weight Piglets 13-272 lbs. 55-265 lbs.